Stories abound about apparitions – that is, an instance of something’s appearing. One of the more famous apparitions is commonly referred to as, “Our Lady of Lourdes.” A young 14-year-old girl, Bernadette Soubirous, reported that she spoke to a woman in a cave near her hometown of Lourdes, France. After her first encounter with the lady in February 1858, she had 17 more meetings with her that year. Unlike Bernadette’s mysterious encounters, pastors regularly and most predictably experience apparitions during Christmas. They have numerous encounters with parishioners who appear at the celebration of our Savior’s birth, not to be seen for another year with possible exceptions at Easter. They come to hear, once again, the preacher in the pulpit share the story about baby Jesus. Christmas, although filled with excitement and anticipation of celebrating the Messiah’s birth, can become a litany of appearances. Christians are crushed by shopping sprees, mandatory social gatherings and endless parties. Before they know it, Christmas fatigue sets in — often by the third Sunday in Advent. Divine worship becomes another “event” for them to attend. They make their appearances and subtly grow indifferent about the birth of Jesus. By now, they wonder what more can be said about Christmas, and there are12 days of Christmas ahead of them! What more can be said about the birth of the Savior? For sinners there is much to share. The law has enslaved humanity under its curse. Redemption is hopeless without God’s intervention and God makes his remarkable appearance at Bethlehem; redemption has come. He came in the flesh and lived among us full of grace and truth. He is man born of woman. May the grace and peace of God manifest among us in the Savior sustain us always in the one true hope that endures for all eternity. Amen. Pictured: (back row) Rev. Arthur Rickman, Rev. Daniel McMiller, Rev. Ted Krey, Rev. Dr. Scott Murray, Rev. Dr. Timothy Quill; (front row) Rev. Dr. Lawrence Rast, Maria De Lourdes, President Alvaro Lopez Fajardo, Rev. Samuel Peréz. 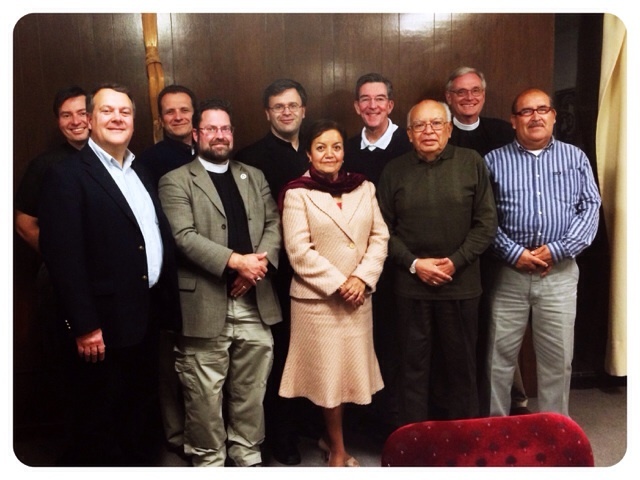 Representatives of the Missouri Synod met with representatives from the Lutheran Synod of Mexico (SLM) on 16 December 2013 in Mexico City, Mexico. 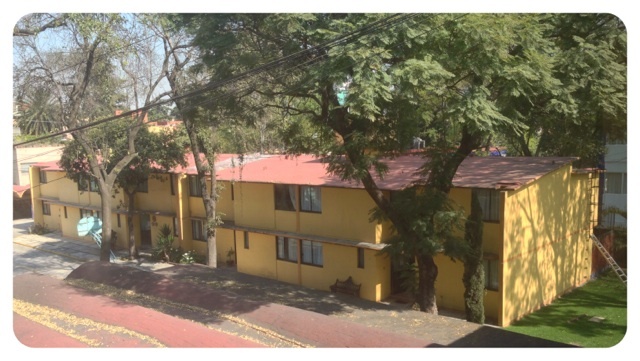 In the early 1980s, the LCMS largely withdrew work in Mexico. On 29 September 2013, the SLM sent a letter to President Harrison asking the Missouri Synod to resume and increase its partnership. The LCMS responded by sending Rev. Arthur Rickman to meet with church officials. In cooperation with the Luther Academy, the LCMS sponsored a conference for SLM pastors and laity. Rev. 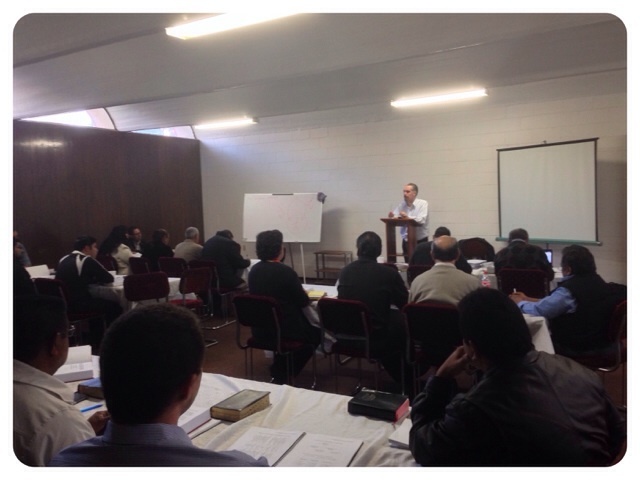 Roberto Bustamante from Concordia Seminary in Buenos Aries, Argentina, was the lecturer. His lectures are focusing on Lutheran identity and the theology of the cross. The conference was held at the Lutheran Center of Mexico City. The Lutheran Center was built in the 1960s largely through the work of the Missouri Synod. As a result of the agreement, the Missouri Synod has a place at the table to discuss how the facility is used to promote Lutheranism in Mexico and Central America. We look forward to the future of a closer partnership between the SLM and the Missouri Synod. The SLM is in altar and pulpit fellowship with the Missouri Synod and a member of the International Lutheran Council (ILC). I skipped a couple days ahead in the Treasury of Daily Prayer to a devotional reading for December 13 (pages 1008–1012). It happens to include some of my favorite scripture readings and hymn, and highlights the Commemoriation of Lucia martyred in AD 304. The name Lucia means “light” and this devotion has depth and thoughtfulness that brings light to the connection between Adam and Eve with Mary and Joseph. It is great to be repeated throughout Advent. Enjoy! From Treasury of Daily Prayer © 2008 Concordia Publishing House. Used with permission. www.cph.org. One of the victims of the great persecution of Christians under the Roman emperor Diocletian, Lucia met her death at Syracuse on the island of Sicily in AD 304. Known for her charity, “Santa Lucia” (as she is called in Italy) gave away her dowry and remained a virgin until her execution by the sword. The name Lucia means “light,” and, because of that, festivals of light commemorating her became popular throughout Europe, especially in the Scandinavian countries. There her feast day corresponds with the time of year when there is the least amount of daylight. In artistic expression, Lucia is often portrayed in a white baptismal gown, wearing a wreath of candles on her head. How Do You Pray After a Tornado? November 17, 2013, St. John Lutheran Church, New Minden, Illinois (pastored ably and faithfully now for nearly 26 years by Rev. Timothy P. Mueller) was struck by a tornado for the third time in its history. Several homes of members across the street were also destroyed. No congregation members were killed, but two people in the community, who had been visited by Pastor Mueller, lost their lives. Both Pastor and people are bringing God’s comfort and peace to family members and to many others. O Lord God, Father, Son and Holy Ghost, unsearchable in the unity of Your essence and the trinity of Your persons, and at the same time incomprehensible in the judgments and ways in which You deal with Your children on earth! In deepest humility and veneration we appear for the first time in our renovated house of God before Your holy face. You have permitted us to experience Your judgments out of Your mighty hand. Twice You have spoken to us by means of storm and weather. Twice You have placed members of this congregation suddenly in the dust of death and have left behind deeply wounded and bleeding hearts. Twice You have allowed this Congregation to weep upon the ruins of their church. Deeply You have humbled us before our brethren in the faith and before the mocking world, as if we were great sinners more than others and not Your dear and precious children on whom You bestow Your hearty and good pleasure for the sake of Your dear Son, in whom we believe and who is the joy and comfort of our hearts at all times. But, dear heavenly Father, although we humbly confess to be great sinners before You who have deserved all Your temporal and eternal punishments, yet Your faithful Word stands before us as a brightly shining sun: “Whom I love, him I chasten” (Hebrews 12:6). And we believe firmly without any doubts, that You have visited us, not in Your wrath but in Your fatherly love and grace and through Your faithful sufferer Job You do call to us: “Behold, happy is the man whom God corrects; therefore do not despise the chastening of the Almighty. For He bruises, but He builds up; He wounds but His hands make whole. He shall deliver you in six troubles, yes, in seven no evil shall touch you” (Job 5:17-19). And You have permitted us to experience the truth of this word now. Yes, You have not only struck and wounded us, but Your faithful and merciful hand as Savior has again raised us up, healed us, and filled our hearts with peace and joy in the Holy Ghost. We have been able to kiss Your chastening hand because we recognize and believe, as You have convinced us, that Your eternal grace and mercy lead us through the sorrow of death to heavenly joy, and from deep outrage to the heavenly crown of glory. See, dear Father, for that reason we appear before You today with joyous praise and thanks to Your divine name in our newly given House of God and confess from the bottom of our heart: This is the Day the Lord has made for us. “O give thanks unto the Lord, for He is good” (Psalm 136:1). You have done great things for us. We rejoice in it. O Lord, help! O Lord, let it turn out well for us! But we ask now, Lord God, Father, You, the Lord of our life, abide with us; it is almost nighttime, the day of this world is declining, its end is coming near. The Judge is at the door. O abide with us with Your grace, with Your Spirit, with Your comfort! Protect this precious house of God and retain in it Your pure Word for us. May Your Word ever be our heart’s rejoicing and comfort! May we, like the wise bridesmaids, watch and pray with patience and good works, seek after eternal life, and be clothed with the garments of the righteousness of Your dear Son Jesus Christ, that when our hour comes or You appear in the clouds of heaven for the final judgment, we be found worthy to stand at Your right in the shining forth of Your eternal glory and may hear the most blessed greeting: “Come unto Me, you blessed of My Father, inherit the kingdom prepared for You. O pious and faithful servants and maids, come, enter upon the eternal joy of Your Lord!” (see Matthew 25:34). Amen, may it be true for us all. Hallelujah! Amen. Amen (from a 1921 History of St. John Lutheran Church, New Minden, Illinois, quoted in Our God, Our Help in Ages Past: 150 Years of Documents, Pictures and Other Tokens of God’s Blessings upon St. John’s Lutheran Congregation, New Minden, Illinois, edited by Pastor Timothy P. Mueller, published by St. John’s, New Minden, Illinois, 1996).